After two years of a seemingly endless barrage of human rights violations by the Trump Administration, HRLR has redesigned the Trump Human Rights Tracker to be a more modern, efficient and user-friendly website. See the new website here. In February of 2017, the Columbia Human Rights Law Review (HRLR) released the “Trump Human Rights Tracker” in collaboration with the Human Rights Institute, Rightslink, and the Columbia Law Human Rights Clinic. Since then, HRLR has tracked more than 60 damaging actions, including human rights violations and many rights undermined or at risk. These actions range from violations of women’s reproductive and equal pay rights, to the detention of immigrants in deplorable prison conditions, to the degradation of our environment. Many of these tracked violations also include updates, which discuss further developments since the initial violations. After two years of a seemingly endless barrage of human rights violations by the Trump Administration, HRLR decided to expand its capacity to maintain the Trump Tracker. Ana Pirnia, one of HRLR’s Online Editors, took charge of the Trump Tracker “revamp,” recruiting a team of law students from Columbia Law School to monitor current events for news of new violations. HRLR also collaborated with Taylor Poulos, a digital product designer (see his website here), who redesigned the Trump Tracker’s appearance and format for a more modern, efficient and user-friendly website. 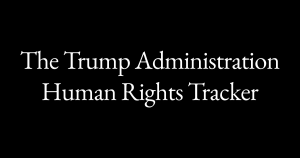 Now, due to the efforts of Ana, Taylor, and many other members of HRLR’s team, HRLR is proud to announce the relaunch of the Trump Human Rights Tracker. Please check out the new website at https://trumphumanrightstracker.law.columbia.edu/. With the relaunch Trump Human Rights Tracker, HRLR remains enduringly committed to helping journalists, civil society organizations, and the general public understand how the Trump Administration is affecting human rights. By compiling potential violations in a user-friendly and modernized website, HRLR hopes to continue documenting and monitoring the wide range of human rights abuses perpetrated by this administration at home and abroad. Like its predecessor, the Trump Tracker will continue to summarize actions taken by the administration, identify the human rights implications, and provide links to sources where readers can access more detailed analysis. For more on the Tracker’s methodology, see our About page. Input from those using the tool is welcome at trumphumanrights@gmail.com.